Here we go folks! 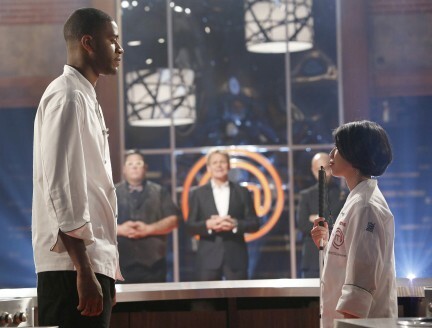 We are one hour away from finding out who the winner of MasterChef Season 3 will be. Will it be Josh, the contestant that was sent home once but fought his way back into the competition and back into the finale, or will it be Christine, the contestant that no one could see in the finale, including herself. Let the fight begin! The 16 homecooks that Christine and Josh took down on the way to the finals come into the gallery to cheer them on for this final showdown. Well, before we get to the showdown let's cry one more time! The judges surprise Christine and Josh with visits from their families...bring on the tears! They get a moment with them and then the families get sent home and the homecooks get ready for the last challenge! The homecooks have two hours to create a three-course meal. They will make an appetizer, entrée and dessert that will hopefully win over the judges and give them the crown of MasterChef Season 3 winner. The winner will be the homecook with the overall best meal. For Josh, the judges are thinking his dishes are all heavy and might not be cohesive. Graham said he is leaning towards Christine and Joe is leaning towards Josh and Chef Ramsay is on the fence right now. The judges come and talk and both the homecooks seem to be composed and not freaking out about this meal. They are halfway through the time and they are working on their desserts and Joe is worried about Josh making a pecan pie with bacon in the crust, but Graham thinks it could go well. Now the big move of the dinner, Josh is making his lobster puree and he puts the whole lobster into the processor. Joe said this could ruin the whole dish for him. Josh said he knows what he is doing, but Joe said it is a technical mistake that may cost them this dish. Time is running out and they have to start focusing on plating their dishes. Everyone seems torn between Christine and Josh, so who knows how this is going to go. They both looks like great plates and I want to taste them!!! Time runs out and plates are completed. I love me some Christine, but I am not gonna lie that Josh's plating is done very well tonight. The judges head to the MasterChef Restaurant and time for them to taste their dishes. Up first is the appetizer and Josh made Butter Poached Lobster with Grits and Sweet Potato Puree. Chef Ramsay said the sauce worked and he loved the crispness on the top, but the lobster is undercooked and nothing buttery about it. Graham said very ambitious and the grits are good, but the lobster is the only thing making him question the dish. Joe said the lobster stock is profound and rich and you have a half-cooked lobster. For Christine, she made Thai Papaya Salad with Crab and Mixed Vegetables. Chef Ramsay said when you present something that simple is has to have profound flavors. Joe said the star in this dish is the dressing and the vegetables are amazing. Graham said he wished he had more crab and the flavor is really nice and balanced. Chef Ramsay said it is good and refreshing and delicious, but he wants more luxurious to it. For the entrees, Josh made Rack of Lamb with Green Curry Sauce, Spring Peas and Carrots. Chef Ramsay said great flavor cooked absolutely beautiful, but he plated it weird with the vegetables. Graham said it tastes good and everything on it is top notch. Joe said spring lamb, summer peas, fall carrots and winter parsnips and he has captured all seasons and an excellent dish. For Christine, she made Braised Pork Belly with Rice, Crispy Kale and Maitake Mushrooms. Chef Ramsay said it has the classic Vietnamese background, but she is in the final of MasterChef. He said the pork belly is delicious and it melts in your mouth and he understands the appetizer now because it is a weighted entrée. Graham said what it lacks in appearance it makes up with the taste. Joe said the dish is slightly sweet and would like something acidic on it. This is it...time for their desserts! For Josh, he made Bacon Crusted Pecan Pie with Vanilla Cinnamon Ice Cream. Graham said the crust seems to be a little oily, but the ice cream is great and beautiful. Joe said he loves his ice cream and great consistency. Chef Ramsay said the ice cream is absolutely nailed and the pastry is good, but he could barely detect the bacon and what is the point? For Christine, she made Coconut Lime Sorbet with Ginger Tuile. Graham said the tuile is beautiful, but he was expecting this acidic lime flavor, but it is more of a coconut sorbet than anything else. Joe said there is a lightness to it and the texture is right. Chef Ramsay said it is fragrant and good after a pork belly. The judges discuss and who knows who will win. Christine's menu was very cohesive and good, but Josh took bigger risks and nailed some of them. I think they are dead-on and I think they are going to go with a male winner for the first time, even though I want Christine to win so bad! The judges come out to announce the winner. After their discussions, the MasterChef Season 3 winner is...Christine!!!! I could not be any happier!